Located in the Red Deer River dinosaur valley, our two-bedroom guest house is situated in the small, quiet community of East Coulee. This property is perfectly suited for both short weekend visits as well as longer working periods or groups. Sleeps up to 7 comfortably, with two bedrooms and a pull-out sofa. Onsite laundry facilities included. Come relax on our patio and enjoy an outdoor firepit and BBQ.East Coulee provides easy access to history and recreation opportunities. 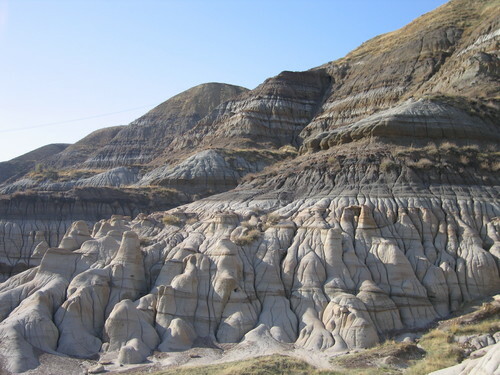 Come hike the badlands, tour the Atlas Coal Mine next door, visit the Royal Tyrrell Museum and other historic sites in Drumheller and the area. Our guest house is the perfect base for exploring the Badlands of Alberta. A quiet, peaceful spot for individuals, small families or couples. Come see what the badlands have to offer. Click here for our list of Things To Do in the area. Don Gerlinger is your host, and manages this older home for visitors. He has lived in East Coulee all his life, and worked at the Atlas Coal Mine before its closure in 1984. Don has operated several businesses through the years, and will ensure that your stay is smooth and as enjoyable as possible.